In Russian there is word тормоз (tormoz) which originally meant "brake" (as in a car), but now is often used to denote a very slowly working software. The nearest word in English I know is "lag". But I am unsure that these are the same. How to translate "тормоз" (in this second sense) to English? Examples of usage: 1. Windows is тормоз compared to Linux. 2. Microsoft Word is a тормоз. There is also a Russian verb "тормозить" derived from this noun. I want its English equivalent, too. If software is тормоз because too many poorly implemented features have been added, then it is "bloated." This bloating might be the result of feature creep, as many 'small' features get added on one after another. Software that has suffered from this problem ends up being called bloatware. If it is тормоз because it is poorly written, and needs to be re-coded, then it is probably "slow," "laggy," "inefficient," or (maybe) "buggy." A software application that is relatively small in size, works quickly, and probably has a somewhat limited feature set could be referred to as lightweight. So more full-featured software that moves slower is, by contrast, heavy. But usually you don't hear that usage; "lightweight" is the more common term. I think the best term is for you situation is simply laggy, which is the adjectival form of lag. Windows is laggy compared to Linux. Microsoft Word is a laggy program. In English, rather than a verb derived from the noun, we just have "lag" as both a noun and a verb. In the software context, "to lag" simply means "to experience lag." The lag in Call of Duty was so bad last night that I couldn't even walk in a straight line. Call of Duty was lagging so hard last night that I couldn't even walk in a straight line. Whether "laggy" really has the same specificity as тормоз in Russian is up for debate. Software can feel laggy because the code is poorly written or just because the machine's hardware isn't up to the task. For example, Adobe Suite products on my five-year-old work computer take forever to start up, and opening new screens can cause a mini-freeze while they load. But on my home computer, the exact same programs open up right away and run very quickly. Is my home computer overcoming laggy software with superior specs, or is my work computer causing perfectly good software to lag because of bad specs? Perhaps a bit of both, but whatever the case, "laggy" doesn't really suggest a root cause one way or the other. Also, note that lag may not have anything to do with the software at all. For example, a clever user experience designer may trick users into thinking his software is faster by modifying a loading screen, when ultimately the software takes just as long to load. Or, in the Call of Duty example above, if I'm playing online multiplayer, the lag I experience is really just ping that happens because one or more players has slow internet and/or is located geographically far away from other players or the game server. It has nothing to do with the game itself (other than the software used to match people up into a game initially). Ultimately, laggy doesn't describe the software per se, but rather how the software feels to use. Sluggish, as in "Microsoft Word is very sluggish", or "Compared to Linux, Windows runs sluggishly". We could say "it runs like a dog". Re the phrase - "my computer is 'running like a dog'". I understand this to mean that my computer is running very slowly. Anything that is 'running like a dog' means it is slow. I've used the phrase "runs like a dog" to mean that my car is on its last legs and can't, sometimes, run anywhere near as fast as a dog can. In the New Partridge Dictionary of Slang, the phrase is said to be Australian slang for "to run or perform slowly", but it is fairly widely used in the UK too. In my experience as a software engineer and avid gamer, there isn't a word we can use like that to denote that software is slow an all contexts, except the word slow itself. In gaming or in a video, this would be noticeable pauses / stuttering while audio may or may not continue. A common hyperbole used to denote that the software takes way longer than it should to accomplish a task. This phrase is essentially synonymous with "painfully slow"; can use it almost anywhere. In the context of operating systems, this refers to too much software being installed, causing the system to noticeably slow down, even when performing tasks while the system is "idle". Similarly, in something like Google Chrome or World of Warcraft, or other software that can include addons / plugins, this references there being too many plugins that slow things down. In the context of general software, such as Microsoft Word, it doesn't make sense for an average user to say that a particular application is "bloated" - they wouldn't have an understanding of the underpinnings of the software to make such an assessment. Just calling it "slow" is more appropriate. "They said Windows lags behind Linux in terms of performance"
"This game is really laggy"
"That video is too choppy; I almost can't watch it!" "I tried to edit the sound clip, but the preview was too choppy"
"His new PC runs really slow; it's loaded with bloatware"
"Her new PC takes forever to boot; it's really bloated"
"The internet is really crawling today. It took more than fifteen seconds to load this page." "Windows really crawls compared with Linux." For slang, potato or potato quality is becoming more popular. It is usually used to refer to old or out of date hardware that works poorly, but can be used to refer to software as well. To refer to software specifically, use phrases like "runs like a potato". The idea is that the thing you're referring to is so outdated or low tech that it may as well be a potato. It's most often used to refer to cameras, microphones, or video recording equipment. "Sorry about the terrible photo, I took it with a potato." The maximum reported download speed was 93 Mbps; the upload max was a far pokier 8 Mbps, which would help explain the snags with the FaceTime calls. By example, one might say "Windows is pokier than Linux" or "Microsoft Word is poky." While I might also use sluggish, I reserve poky for derisive needs: poky denotes the slowness is annoying, while sluggish merely states a fact (being "slug-like"). 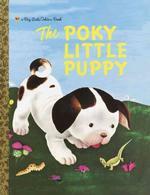 As of 2001, The Poky Little Puppy was the single all-time best-selling hardcover children's book in the U.S., having sold nearly 15 million copies. Since so many American children have read this book, and have associated the word poky with slow, it's reasonable to assume an American audience would fully understand its usage in this form. However, note that when describing a place, poky also means small and cramped. Apparently to "English" English speakers, the "small and cramped" definition also applies to vehicles. While I feel poky conveys the derision you're wanting from the Russian тормоз, you have to be aware that readers from different regions may recognize this word from its other definitions. In this particular context I would say that the nearest equivalent word is bloated. "Windows is bloated" not only conveys the fact that Windows is slow, but also accurately describes why Windows is so slow. Software professionals frequently use the word bloated to describe software that is very slow because it is too big and fat, usually because it is over engineered or has a lot of legacy baggage. Not the answer you're looking for? Browse other questions tagged word-request slang terminology informal-language or ask your own question. What is the English word for “military certificate”? What is the common term for the word “menstruation”? Is there an English word equivalent to the Cambodian word “oudom'kati”? What is the correct word for “Semangat” in English? What is the word for “seperate into 2 parts”?